From the Cumberland Gap to the Atlantic Ocean, this is Virginia Water Radio for the week of September 10, 2012. This week we feature another mystery sound. Have a listen for about 20 seconds, and see if you can guess what’s making these squawks, squeaks, and cackles. And here’s a hint: The landscape is probably green if you’re hear-on these sounds in Virginia. If you guessed a Green Heron, you’re right! Green Herons are common summer residents in all kinds of freshwater and marine habitats throughout Virginia and much of the United States. They’re rarely seen in Virginia during the winter, which they spend along the southern U.S. coasts and in Central and South America. Green Herons are one of the smallest herons found in North America; they’re only about one-third as tall as the continent’s largest heron, the Great Blue. They can make a variety of sounds for different situations, including raising an alarm, advertising for a mate, or defending a nest. The birds are predators on fish, frogs, and other aquatic animals, and they’re remarkable for their practice of dropping leaves, live insects, or other materials onto the water surface as lures for their prey. Thanks to Lang Elliott for permission to use this week’s sound. Green Heron photo by Gary Kramer, made available for public use the U.S. Fish and Wildlife Service's National Digital Library, online at http://digitalmedia.fws.gov, accessed 9-10-12. Immature Green Heron at Claytor Lake State Park near Dublin, Va., September 23, 2012. Photo by Alan Raflo. Acknowledgments: The sounds of the Green Heron were taken from the Stokes Field Guide to Bird Songs-Eastern Region CD set, by Lang Elliott with Donald and Lillian Stokes (Time Warner Audio Books, copyright 1997), used with permission of Lang Elliott, whose work is available online at http://www.langelliott.com/ and the “Music of Nature” Web site, http://www.musicofnature.org/ (as of 9/10/12). Sounds of Green Herons were used previously as part of a longer Virginia Water Radio episode (#48, week of January 10, 2011). 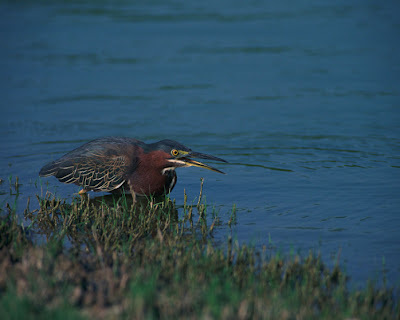 Sources and More Information: The scientific name of Green Heron is Butorides virescens. 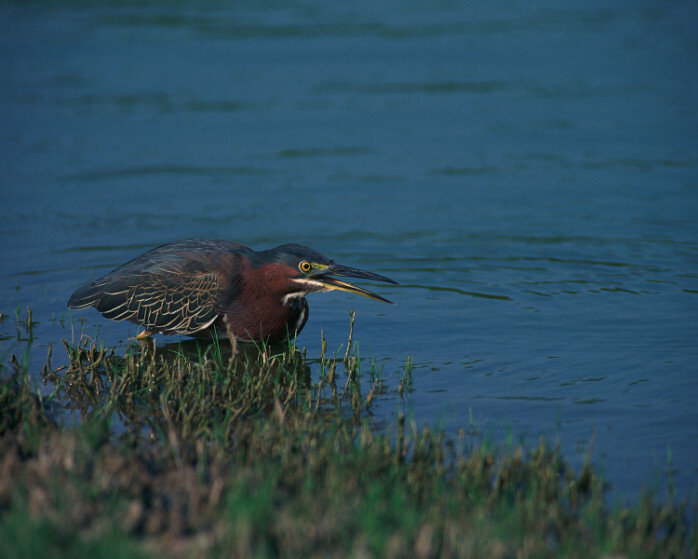 Information on Green Herons was taken from the Wildlife Information Database maintained by the Virginia Department of Game and Inland Fisheries, online at http://vafwis.org/fwis/?Title=VaFWIS+Species+Information (as of 7/9/12); A Guide to Field Identification of Birds of North America, by Chandler S. Robbins et al. (New York: St. Martin’s Press, 2001); and the Cornell University Lab of Ornithology’s “Bird Guide” Web site at http://www.allaboutbirds.org/guide/search, and the Cornell lab’s “Birds of North America Online” at http://bna.birds.cornell.edu/bna. Both Cornell sites include photos, distribution maps, recordings of calls, and ecological information on birds throughout the Western Hemisphere; a subscription is required to use the “Birds of North America Online” site. For more information about birds or bird-watching in Virginia, visit the Web site of the Virginia Society of Ornithology at www.virginiabirds.net; or the “Wildlife Information” Web page of the Virginia Department of Game and Inland Fisheries, at http://www.dgif.virginia.gov/wildlife/, which includes the March 2010 “Official List of Native and Naturalized Fauna of Virginia” (as of 9/10/12).